I'm Alex Wallace, owner and dog photographer for The Dogs By Alex. 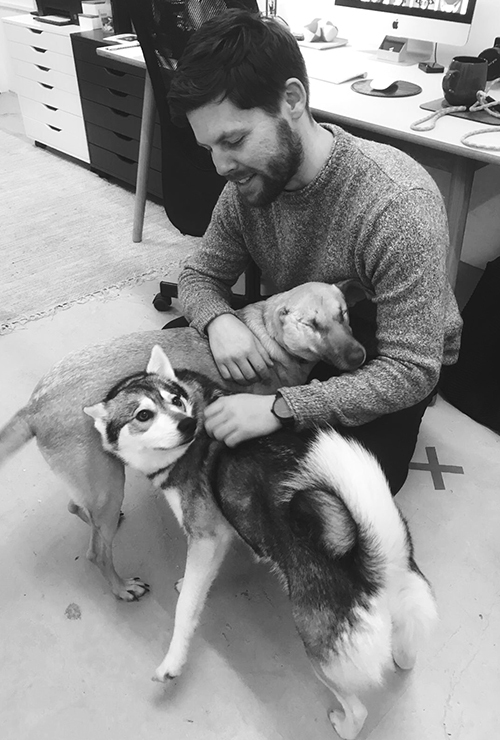 I founded the company, based in my London studio, to marry two of my favourite things in life, photography and dogs. The Dogs By Alex is about beautiful dog portrait photography. Growing up in a dog-loving family, they’ve always been part of my life. We adopted our own rescue Jed when I was a nipper, I volunteered in rescue centres, fostered and finally adopted my own wee man Ludo in mid 2018, pictured here. I love meeting new dogs, big and small, hearing their own stories, and capturing the different personalities of each one through my dog photography. I come from a portrait photography background (www.alexwallace.co), working for advertising, PR and editorial companies. Now applying my style to dog portraiture I aim to create stylish and characterful photographs of our canine pals. I can’t speak highly enough of Alex and the photographs he took of our two dogs. He was absolutely brilliant with them, and the whole process was really enjoyable and relaxed. Our dogs are quite a handful so it could easily have descended into mayhem in less calm and professional hands!